The digital world is forever in flux mode, with the online landscape evolving rapidly on a near-daily basis. This means marketing and traditional communication channels need to work closer than ever before - think of them as the online version of peanut butter and jelly. Because publications are increasingly moving online, a new space has opened up for collaboration between PR and SEO. Quality content and outreach are more important than ever and form a key part of SEO success. And, hey! PR knows all about good content and outreach. In fact, it’s critical that these two marketing segments work together as off-page SEO and digital PR strategies are basically the same thing, with both prioritizing guest blogs and media coverage in exchange for a much-coveted link. Though SEO and PR are basically climbing the same mountain, the people that work in each department are often in the dark about the other. Traditional PR folk rarely know the ins and outs of meta descriptions, keyword data, and anchor text, while SEO experts might not know the best way to reach out to a global publication. There’s a lot to learn from both sides, and your SEO campaign will see the most success if everyone is in the know. Before you dive into PR as part of your wider campaign, educate each department on the whats, hows, and whys in a series of short, digestible sessions. The key thing to emphasize here is how each department will benefit from working collaboratively with the other. Once everyone’s in the know, it’s time to start prioritizing your PR strategy efforts. 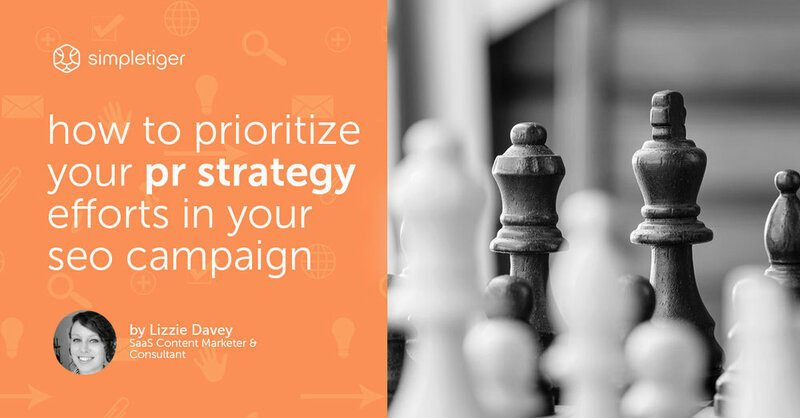 Goals are everything when it comes to a successful campaign. Without them, you don’t know how far you have to go or whether what you’re doing is even working in the first place. Your PR strategy and SEO campaign should work together in harmony with aligning goals. This means coming to a clear understanding on who your brand is trying to reach and through what mediums. For example, if your “big goal” is to boost local SEO efforts, your campaign will dramatically benefit from your PR team reaching out to local and regional publications for placements. On the flipside, your SEO team can carry out research into the rankings of various outlets to determine which ones will provide the biggest ROI if the PR team can get a placement. Keyword research is probably an alien term to your PR team, but it’s a vital component of any SEO campaign (and your SEO team will be well aware of that). This is the perfect opportunity to carry out keyword research before even thinking about pitching in order to hone the main brand message and to determine what keywords and phrases the pitches should focus on. From the PR side, it’s worth including links to key pages on your site to guide readers to more information. These links often get transferred over to the media outlets, which means data and thought should go into them. Did we mention that quality content is the holy grail of the online world? It’s one of the biggest factors in Google’s ranking algorithm and it cements your brand as an authority. But consistently creating epic content isn’t easy; it takes time, effort, and resources to get it right every time, so by trying to create separate content for your PR strategy and SEO campaign you’re giving yourself extra, unnecessary work. Instead, why not create content that can work for both departments? Things like infographics and videos are ideal for sharing with publications and media outlets, and they’re also great for sharing on your own site and social media channels to help with on-site ranking factors. Once you have a cornerstone piece of content like an infographic covering key industry statistics, you can use it in guest posts, for social sharing, and for pitching to major publications in your niche - it’s win-win for everyone involved. Alternatively, you can share what’s been created by both departments so the other one can pull from that content and repurpose it to suit their own needs better. For example, if your PR team has gathered together key statistics about a current trend and are pushing it out to local media outlets, your content marketing team can then turn it into an infographic or a long-form blog post to help your own website rank better on the search engines. Once you’ve crafted your awesome content and have started pitching it to publications and major blogs in your industry, it’s time to optimize the links you do land to improve your SEO efforts. When your PR team land a piece on a top site, your SEO team can work alongside them to optimize the links that have been earned. This means choosing anchor text and links to pages that need a boost in ranking. As the PR world becomes more and more digitized, the tactics it employed in the past are becoming more relevant to SEO campaigns: landing high-quality links on top-notch publications is a great way to boost search engine rankings while getting extra coverage for your brand. But, in order to create a well-oiled machine that consists of both PR and SEO efforts, it’s important that you know what you’re working towards. When you create aligning goals and incorporate key tactics from SEO into the pitching process, you create a more powerful way of landing earned coverage that has solid links from keyword research and passes on that all-important link juice to your website. If you haven’t already thought about bringing together your PR and SEO strategies, it’s time to start merging the two as they become more and more intertwined.